Meudon is a major icon in the history of photograph and its often used as an example in the evolution of photographic composition. I wanted to see if Andre Kertész’s famous 1928 Paris scene still existed, so turned to Google maps for this task. 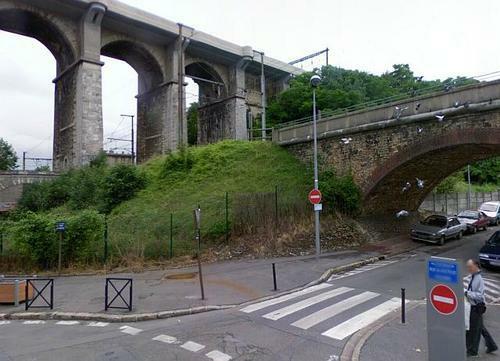 As the above shows there are actually TWO viaducts in Meudon. This view from Avenue Jean Jaures shows the point at which Kertész’s steam engine was pictured crossing the valley. 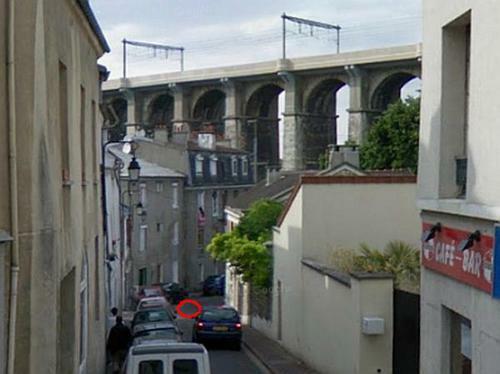 Below that point is the newer viaduct. 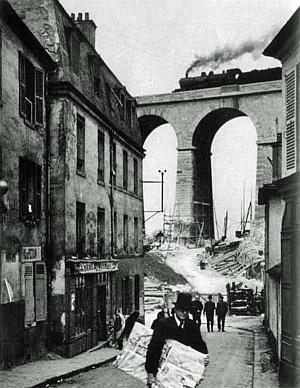 If one looks carefully at Kertész’s picture, this lower viaduct can be seen under construction. The road leading off right is Rue du Docteur Vuillieme where Kertesz took his 1928 photograph. The upper viaduct looks different these days because it has been widened to take extra tracks across the valley. 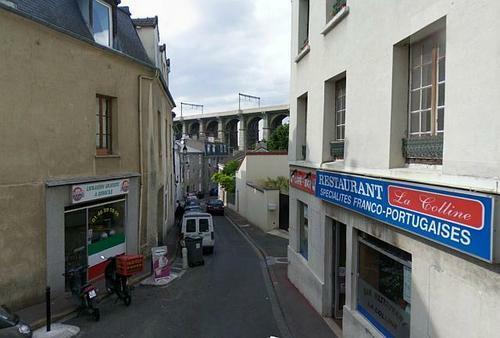 This is a view looking down Rue du Docteur Vuillieme, by its junction with Rue du Val in Meudon showing the viaduct in the distance. The building at the far end of the road (with its dormer windows) is the one seen in Kertész’s picture. A crop showing the other end of Rue du Docteur Vuillieme. The red circle is roughly where Kertész would have stood whilst taking his famous picture. For comparison with the previous two pictures looking down Rue du Docteur Vuillieme, this is a low-res view of Kertész’s famous 1928 photograph.